Building on our deep expertise and scholarly contributions in social and for-profit entrepreneurship, Drexel University is dedicated to the translation of new knowledge generated by its faculty, staff, and students into practical use. At Westphal College, we integrate studio education and experiential learning with entrepreneurship studies to cultivate graduates with a knowledge of aesthetics, function, history, ethics, technology, economic realities, and the importance of addressing the pressing issues of our times, and provide the appropriate balance of a solid foundation with individual creative direction, cultural awareness, strong technical skills, and an understanding of management and professional practice. Below are links to programs and organizations that help us accomplish our mission in supporting tomorrow's creative entrepreneurs. Westphal's Nina Henderson Challenge is a terrific opportunity, open only to Westphal students, in which student teams from all of the College's programs are invited to develop and submit original three-page business concepts and, if they choose, complete business plans for competitive consideration. The Nina Henderson Challenge follows the same format and adheres to the same submission dates as the University-wide Baiada Competition. This incubator for student start-ups provides a unique experiential opportunity to current undergraduate and graduate Westphal College students and recent alums to turn their ideas for new products, services, or enterprises into a reality. The Close School of Entrepreneurship is one of the first freestanding schools of entrepreneurship in the nation to offer degrees. Building on an outstanding foundation of curriculum, programming, and thought leadership at Drexel, the Close School is the engine driving the expanded culture of entrepreneurship envisioned by the University’s strategic plan. The Close School believes that entrepreneurship is not just a technical process of launching new companies, but is a set of personal and professional skills that foster the pursuit of innovation in business, personal, and career contexts. Students in every college and school at Drexel are able to connect through the Close School through an Entrepreneurship minor, their innovative Launch It! Class which provides seed money to support projects developed during this for-credit class, and extracurricular activities that support their entrepreneurial efforts. The School serves the regional entrepreneurial and business community through its thought leadership in entrepreneurship research. The Baiada Institute bridges education and entrepreneurship by linking research, coursework, experiential learning, and entrepreneurial thinking with practical guidance for budding entrepreneurs. The Institute's mission—underscored by a deep interdisciplinary nature to develop entrepreneurial leaders and foster the creation of successful technology ventures within the Drexel community—distinguishes it as one of the nation’s leading entrepreneurship programs. Students from every academic discipline are encouraged to participate in the Institute, through interactive workshops, entrepreneurial courses, and an annual Business Plan Competition and Entrepreneur Conference. Visiting us is the best way to get firsthand information about a Westphal College education. 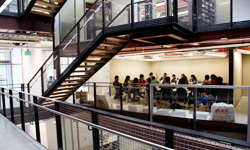 Drexel offers a wide range of undergraduate and graduate programs. Choose a level and format to learn more and apply today.